I only have one year experience but I am certified, I am thinking I made a mistake to go into coding, because there are no jobs for entry level coders, any ideas????? Although I love coding I would hate to leave the field. I'm completing a Professional Medical Coding class at the end of August and have signed up to take the CPC exam in September. I live in western NH and am experiencing the same thing--employers want experienced coders. To gain coding experience, some of my classmates are volunteering. I'm sorry I don't have any suggestions for you, but I can tell you there are lots of us in the same situation as you are... Everyone keeps telling me not to give up, to apply for anything I'm qualified for so I can "get my foot in the door". There are A LOT of coders with college degrees. Nothing is easy in any field. Did you do research before going to school or did you assume all that was said to you was correct? It is not the job of AAPC nor future employers to give you a job. That is all up to you. Are you testing when you turn in your applications? I know most companies will require you pass their test before granting an interview. All I can tell you is network and take anything you can to get your foot in the door. I realize it is a catch 22. However, this is not a field that just anybody can do either. Well stated eadun2000. When I get on these forums to network I am taken back by so many who think that AAPC is responsible for the job market and not being able to get a job. Nothing in life is guaranteed, I have 3 kids currently in college or techincal school and I've drilled it into them that it may not be easy getting that first job but not to give up. Can I go and blame the school? No- you need to research the market you want to get in, talk with others already within that field, look in the papers to see what employers are looking for? Are they looking for entry level or must you have so many years or experience? These are all questions that should be asked and found out prior to committing to spending the money? The way I see it no one "twisted your arm" to get into the coding field, you make that choice. Please lets stop playing the "blame game"!!! Not sure what happened to this post. AAPC moderators didn't like the trash talking, maybe? Should have left it up, whether it be Angela or the AAPC mods that took it down. I'm sure people would have had comments as to how much a bad attitude could deter employers from wanting to hire you. I see these posts all the time and I feel for all the coders finding it hard to find work right now. It's tough right now for anyone to get a job regardless of the profession. Honestly though, think about it this way. If you were in charge of hiring for a company, would you want to hire someone who would so easily give up on something of such importance because they encounter some hardships? I know I would not want to hire someone if I knew that their general outlook was like that of the above poster, Angela. In my opinion, 3 months is not that long and certainly doesn't warrant an AAPC against the coders conspiracy theory. The AAPC isn't here to hand jobs out. 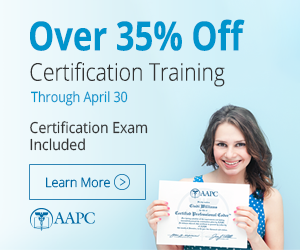 The AAPC is here to help you develop the skills needed and get the credentials to prove you have the skills needed to work in the coding/billing field. Where's the perseverance, people???? I agree with the numerous posts that I've seen advising all the new coders to get that foot in the door. I've been told all my life, it's a lot easier to get a job when you have a job than it is to find a job when you really need it. Some of the coders working for the company I work for started out as receptionists and medical records clerks. They made a living while they studied and took their exam. Once they passed, they tried for coding positions. There are doctors' offices and hospitals out there everywhere. There are other ways to get out there and find work but, the most important thing is, don't just give up.